A. typhlocyba is a parasitoid of leafhoppers that feeds internally on nymphs and later appears externally on adults. As the species name implies, it parasitizes the white apple leafhopper, Typhlocyba pomaria, but it may also use other leafhopper species as hosts. Aphelopus species were studied as early as the 1930s but have not been exploited to any degree as biological control agents. Parasitized adult leafhoppers have been found in samples from a mixed population of rose leafhopper and white apple leafhopper from apple and sweet cherry orchards in the Mid-Columbia area of Oregon. Although thousands of adult leafhoppers from central Washington have been examined, no evidence of this parasitoid has been found. Little is known about the specific host range of A. typhlocyba. Other species of Aphelopus are reported to parasitize only Typhlocyba leafhoppers. Some species of Dryinidae are know to be species specific or limited to a very small number of hosts. Early stages of the larvae are not visible without dissection of the host. The latter stages are grub-like and can be seen inside a sac-like protrusion on the abdomen of the leafhopper. The sac is formed from the cast larval skins of the parasitoid larva and is attached to the side of the host’s abdomen between two abdominal segments. When the larva is mature (about 2 to 4 weeks after the sac becomes visible), the oval sac is nearly as large as the host’s abdomen. 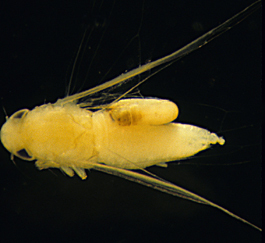 Mature larvae are white, about 1/8 inch (3 mm) long, pointed at the head end, and have a rounded posterior. The larva spins a cocoon in which to pupate. The cocoon is white, oval, and about 1/12 to 1/8 inch (2 to 3 mm) long. The adult is a small wasp about 1/12 inch (2 mm) long. The primary body color is dark brown to black, but the first two pairs of legs, clypeus and mandibles are pale colored. The forelegs are adapted for grasping leafhoppers during egg laying. The antennae are filiform, or thread-like. A. typhlocyba overwinters in the larval stage in a silken cocoon in the ground. Adults emerge in late spring and search out hosts. Eggs are laid in leafhopper nymphs and develop inside the body, where they consume the internal organs. The sac becomes visible in the adult stage of the leafhopper, often pushing the wings out of position. Visibly parasitized adult leafhoppers occur in June and July. The leafhopper remains alive and active until a few days before the larva matures. The mature larva emerges from the host, drops to the ground, spins a cocoon, and pupates in the soil. The remains of the leafhopper mummy may stay attached to the leaf for a considerable period. The combined cocoon and pupal period lasts from 24 to 48 days. The adult parasitoids emerge during late July and August. This brood attacks the second generation of white apple leafhopper. Parasitized leafhoppers often exhibit reduced or deformed external genitalia. Although they reach adulthood, they are incapable of reproduction. A. typhlocyba may be monitored by checking for parasitized adult leafhoppers. These should be easily seen by aspirating adults from the trees or examining adults caught on sticky traps. This species is probably sensitive to many orchard pesticides and is kept at low levels where broad-spectrum pesticides are used routinely, especially during the periods of adult activity. Discing when the larvae and pupae are in the ground will kill a high proportion of the population. Softer programs may allow populations to build. It is not known if A. typhlocyba is established in some regions of Washington or if it may be successfully introduced to supplement biological control by Anagrus epos.